I think the case can be made for such a framework. Peter Fisher ran the trading desk at the New York Fed for many years, and knows well how these markets work. His assessment is that such a framework would work, saying “we could get back and manage it with quantities; it’s not impossible. We could just re-engineer the system and go back to the way we were.” I spent time in the markets for federal funds watching how they operated in those days, and I wrote up an institutional description of how good experienced people traded in these markets, and I developed a model showing how the market worked. The fed funds market is currently moribund, but just a few years ago it was buzzing with activity. Banks that didn't have enough reserves at the end of the day to meet requirements could go to the fed funds market and buy them from banks who had excess reserves, the price they negotiated referred to as the fed funds rate. I disagree with John Taylor. Resuscitating the fed funds market is not a good idea. The fed funds market is no longer used because the Federal Reserve has stuffed the market with so many reserves that banks no longer need to buy them from other banks to meet their requirements. But this cornucopia is a good thing. Any effort to bring back the fed funds market would ruin it. Let's set up an analogy. Imagine a country called Waterland that gets tons of rain and has plenty of lakes and rivers. Since everyone has immediate access to water, there is no market for the stuff. The price of water is zero. Say that the government establishes control over the waterways and rainfall. It decides to limit the amount of water that is available to the citizens of Waterland. In response to this artificially-imposed scarcity, a market develops in which citizens buy and sell water among each other. Markets are great. They allow those with too little of something to trade with those who are good at conserving what they need, both sides improving their lot in life. But this particular market should never have existed in the first place. Water is plentiful in Waterland, and so it should be a free good, not a market-traded one. The entire apparatus that has been built around the exchanging of water—informed dealers, speculators, exchanges, warehouses, networks for transporting water to and from market, auditors and lawyers involved in verifying water transactions—represents a waste. By consuming resources in constructing and operating the market, other more important projects never see the light of day. If the absurd water scarcity were to be removed, the market for water would disappear, freeing up resources for more socially beneficial uses. Reserves, like water in the previous example, should by all rights be free. The only effort the Fed incurs in introducing a new unit of reserves into circulation is a keystroke or two. This means that the Fed can provide a bunch of new reserves, say by conducting open market operations, without incurring any costs whatsoever. As the Fed continues to mouse-click new reserves into existence, the demand that each individual bank has for reserves will eventually be satiated. Once that point is reached not a single bank will need to bid for the reserves of another bank, and so there will be no activity in the market for reserves. The fed funds market is effectively dead, as is currently the case. Taylor wants to bring back the fed funds market. But this would mean putting an artificial constraint on the amount of reserves that the Fed supplies, much like Waterland's frivolous constraint on water. Banks, their satiation for reserves now being replaced by an artificial hunger, would suddenly be willing to pay a fee to other banks in order to get their hands on some reserves. A whole fed funds trading apparatus would re-emerge. Traders would have to be hired and trained to to fill newly-formed fed funds desks. Bank resources would be diverted away from other valuable projects towards plotting the best way to time outgoing payments, the idea being to reduce the need to hold reserves in order to lend them out in the fed funds market. The Fed itself would have to rehire Peter Fisher to run its open market desk. All of this would be an expensive investment of time and money, diverting resources from other more socially beneficial activities. In calling for a return to the days of an active fed funds market, it is as if Taylor were advocating for an artificial constraint to Waterland's supply of water, solely because he admired the market for water that emerged. Never mind that the whole water trading apparatus, though wonderfully efficient, represents a massive missallocation of resources. Given that I'm pretty sure Taylor would not want to kickstart a water market in a hypothetical Waterland, I don't understand why he is so keen to reboot the fed funds market. 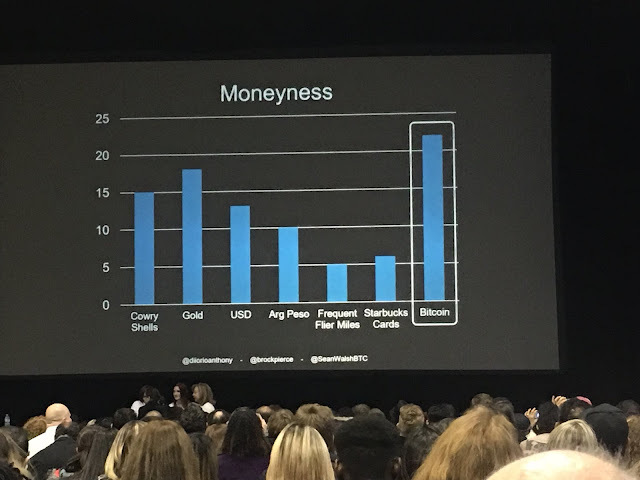 Courtesy of Kerry Taylor's twitter feed, here is a chart which was presented during a recent investing conference in Toronto. Apparently bitcoin has a moneyness score of 22 while cowry shells ring the bell at 15, both of them exceeding the moneyness of U.S. dollars at 13. The presentation that contains the chart was created by angel investor Sean Walsh and is available here. Since my blog is called moneyness, and I've written quite a lot on this topic, I feel somewhat obligated to chime in. Let's start with the good bits about the chart. Instead of classifying items as money-or-not, we can appraise objects by their degree of moneyness. Because every valuable object or instrument is exchangeable, some more easily than others, everything lies somewhere on the money spectrum. The diagram below illustrates this idea. This way of looking at things can provide some insights that we don't normally get when taking the money-or-not approach, and its nice to see that folks like Walsh are using it. (For a longer explanation of moneyness, go here). Now the not-so-good bits. Let's go and see what Walsh means by the term moneyness. On page 14 he lists six characteristics of money including scarcity, durability, divisibility, recognizability, fungibility, and tranportability. Walsh compiles an instrument's moneyness score by assigning a value from 0-4 for each characteristic and then summing this up. The maximum score is 24, with bitcoin losing just a point on durability and fungibility. He gives no explanation for how or why some instrument might get a 3 for, say, recognizability instead of a 4, so I guess we'll just have to assume he has a consistent method for rewarding points. There are two reasons why I disagree with this approach. First, even if we accept Walsh's definition of moneyness and his choice of rankings for each instrument, his list of attributes is incomplete. It is missing one of the most important ones: price stability. When people accumulate balances in anticipation of spending needs, they expect those balances to hold their value for a few days, maybe weeks. If the medium's purchasing power is volatile, then there is a risk that the stuff in their wallets won't allow them to meet tomorrow's spending requirements, which means it isn't doing a very good job as a medium of exchange. Bitcoin probably has the lowest stability of the instruments in the chart. My second and more important criticism has to do with the way that Walsh measures moneyness. In a hard science like chemistry or geology, ranking each objects' physical characteristics might pass muster. For instance, geologists use the Mohs Hardness Test, a scale from 1-10 for testing the resistance of a mineral to being scratched. Walsh is running something like the Mohs Hardness Test, except for monetary instruments. But economics involves humans. And in economics, we are not interested in the physical characteristics of the goods and services people buy, say how hard a mineral is, or how cushy a couch is, or how fast a car can go. Rather, we are interested in the subjective evaluation economic actors place on those objects and the manifestation of these preferences in the form of market prices. So the way to accurately measure moneyness isn't to design the equivalent of Mohs Hardness Test for monetary instruments, but rather to find out what price people actually put on that moneyness. One way to do this is by asking how much compensation people would expect to earn if they were to give up an object's moneyness for a period of time. More specifically, say you are offered a deal to buy one bitcoin but are prohibited from selling that bitcoin for one year. How much less would you be willing to pay for this locked-in bitcoin than a regular bitcoin that you will probably hold for at least one year anyways? If a locked-in bitcoin is worth, say, $500 less to you than a regular bitcoin, that means that you place $500 on a regular bitcoin's one-year tradeability, or its moneyness. We can also think about moneyness in terms of interest rates. What rate would you need to earn on a locked-in bitcoin to compensate you for the nuisance of giving up its ability to be used as an exchange medium? 10%? 5%? The extra interest you expect on locked-in bitcoin is the degree to which you value a regular bitcoin's tradeability, or moneyness, over that time-frame. The price of a dollar's moneyness is easy to measure. Someone who will have a spare $10,000 on hand for the next year can hold it in a government-insured chequing account and earn 0% or they can lock that amount into an insured term deposit and earn around 0.85% (I'm using Canadian numbers for non-cashable 1-year GICs). By locking in the $10,000, an individual's ability to mobilize these dollars as a medium for making payments has been effectively destroyed for 365 days. They cannot buy stocks or bonds with it, nor convert it into cash, nor purchase peaches, tables, labour, travel, etc. Their dollar are inflexible; they have no moneyness. People are willing to accept this burden but only if they are compensated to the tune of 0.85%. Put differently, the 0.85% rate represents a large enough carrot that marginal depositors are roughly indifferent between holding money in a chequing account for a year or locking it in. So if $10,000 in a term deposit provides a pecuniary return of $85, then $10,000 dollars held in a 0%-yielding chequing account provides around $85 in non-pecuniary monetary services, or moneyness, over the course of the year. To carry out this measurement for bitcoin, we'd have to determine what sort of rates a large international bank provides to bitcoin term depositors. I doubt this measurement can be made since reputable banks don't deal in bitcoins. So bitcoin's moneyness is not 22. We have no real idea what it is.